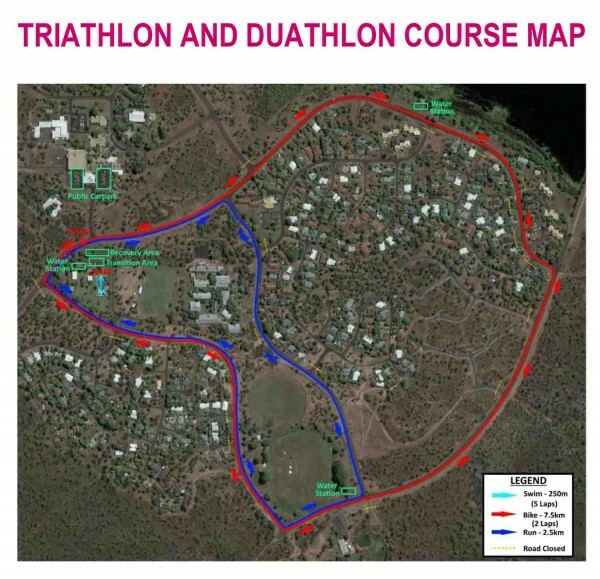 We wish to advise that you may be affected by road and/or carpark closures on Saturday, 11 May 2019 as part of the Kakadu Triathlon in Jabiru. These closures will ensure participants can complete the triathlon and duathlon in a safe manner. A map with markings of all streets which will be closed off has been attached to provide you with as much information about the event as possible (please turn page over). PLEASE NOTE: ALL RESIDENTIAL ROADS IN JABIRU WILL BE CLOSED FROM 6.30am to 9.00am, SATURDAY, 11 MAY 2019. If you need to travel during the morning, please ensure you leave BEFORE 6.30am or plan to leave AFTER 9.00am to get to your destination. These closures will be enforced by road marshalls. Re-opening of roads and carparks is anticipated to occur at times provided above however it could be earlier or later depending on the last participant finishing. The one exception to this is the Jabiru Swimming Pool Carpark will remain closed until 11.00am to cater for the awards ceremony. Participants and spectators are encouraged to walk to the marshaling area at the Jabiru swimming Pool. Alternatively the carparks at the Jabiru Town Plaza will remain open and you can park here however you will need to arrive BEFORE 6.30am. The emergency contact number for the event is 0475 564 621. This number can be used if you require urgent access to roads or carparks between 6.30am and 9.00am on the day of the event. For all other emergencies ring 000. If you require any further information or have feedback on the above road closure for the Coordinating Committee, please call Jerry Pena on 0429 235 918 or (08) 8979 9444. These road closures are a small but essential measure to ensure the race is enjoyable for spectators and safe for participants.